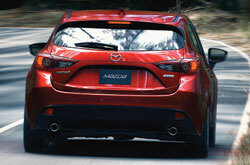 The widely popular Mazda3 has received a complete makeover for 2014, bearing little resemblance to its former self. Available in sedan and hatchback variants, the 3 enters the new year much lower and more refined than before, and sports distinct character lines, an elongated hood, dramatic headlamps and a brand-new five-point grille, outfitted with Mazda's signature emblem. Complementing this all-new look is a collection of freshly-introduced components, which include the MAZDA CONNECT infotainment system, Active Driving Display and advanced available safety features. The Mazda3's fuel-efficient engines have also been improved and now output additional power, increasing the car's overall performance. The latest 2014 Mazda3 is the first vehicle in the nameplate's lineup to receive the all-new MAZDA CONNECT infotainment system. Completely innovative, the HMI system allows drivers to take advantage of extensive technological functions all while helping them remain focused on the road. Features offered with the program include Pandora, Sirius Satellite Radio, voice-activated text messaging, smartphone integration and navigation. Active Driving Display is also available on the 2014 Mazda3 in Houston for the first time and is outfitted behind the meter hood, providing drivers with navigation directions, vehicle speed and an array of other useful information - acknowledged in various 2014 Mazda3 reviews. Additional new technology features offered on the 3 this year include a line of safety functions such as blind spot monitor, lane departure warning, forward collision warning and Smart City Brake Support. Incoming Mazda3 models will be available with your choice of a 2.0L four-cylinder engine or a 2.5L four-cylinder engine. Each option comes with an upgraded exhaust system for the new year and now exerts more power than in previous years. The smaller 2.0L engine delivers 155 horsepower and 150 lb.-ft. of torque, while the 2.5L powertrain produces 184 horsepower and 185 lb.-ft. of torque - mentioned in Edmund's 2014 Mazda3 review. Both engines also feature great fuel economy and exhibit quick acceleration. 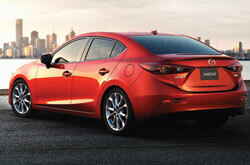 To learn more about the 2014 Mazda3 in Houston, continue down for extra details and spec information. The 2014 Hyundai Elantra, Chevy Cruze and the Honda Civic are no match for the 2014 Mazda3! 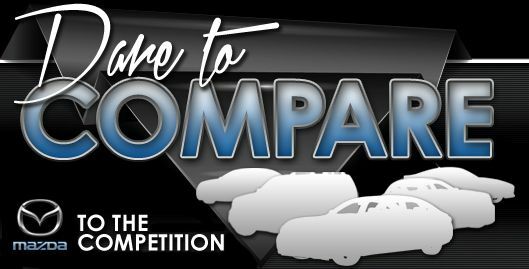 Just compare Mazda's newest model side-by-side with them and you'll find out that it scores higher than the competition easily. The Mazda3's advanced cabin amenities and cut-rate sticker price are just a few of the notable attributes that shoppers will benefit from. Compare its price against the vehicles in its segment and you'll undoubtedly see that it's a fantastic value, which makes it a first choice for many Houston Mazda customers. For more information, check out the Mazda3's quick-facts list below this paragraph. 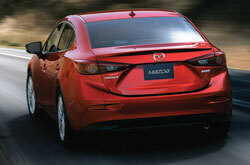 Do you want to know more about the 2014 Mazda Mazda3's features and specs? After reading the review above, visit Joe Myers Mazda and experience the Mazda3 up close. With the aid of some of the most skillful automotive writers in the trade, we've managed to get reviews produced for all of our models. The above article is bundled with accessible facts - it contains info about cabin amenities and other specs so that you can make intelligent decisions about the Mazda you want to buy. Want to read other Mazda car comparisons and reviews? Then visit our digital research index, where you'll learn about other new vehicles available at Joe Myers Mazda.